Helen Martins was born in December 1897 and grew up in Nieu-Bethesda as the youngest of six children. She obtained a teachers diploma in nearby Graaff-Reinet and, around that time, married Johannes Pienaar; a teacher, dramatist and in later years a politician. The marriage did not last long and knowledge about her activities in the years that followed is sketchy and often contradictory. She certainly spent time in the Transvaal (now Gauteng), Cape Town and Port Elizabeth. 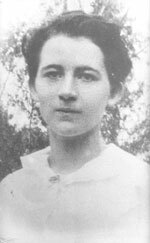 Helen returned to Nieu-Bethesda in the nineteen-thirties to care for her ailing and elderly parents. Her mother, who had long been an invalid, passed away in 1941. 'Oom Piet' Martins died in 1945, and Helen Martins was left alone, with few prospects, in this remote Karoo village. It was some time after this, somewhere in her late forties or early fifties, that 'Miss Helen', as she became known, was to begin to transform her surroundings. It is certain that Miss Helen sought praise and attention through her work but as time progressed, and derision and suspicion grew within the village, she became increasingly reclusive. Miss Helen was notorious for not taking care of herself and as time, arthritis, and the arduous nature of her undertaking took its toll on her physique, she became increasingly shy of her appearance and took great pains to avoid seeing people in the street. The friends that she had, however, describe her as an intensely passionate person who became particularly animated and excited when discussing the latest ideas for her beloved creation. In order to pursue her vision, Miss Helen had successfully managed to endure great physical and emotional hardship. That is, until her eyesight began to fail her. On a cold winters' morning in 1976, at the age of seventy-eight, Helen Martins,took her own life by swallowing caustic soda. It was her wish that her creation be preserved as a museum. And, her desire to be recognised as an artist is magnificently realised in the attention accorded to the Owl House and the fact that her artwork, once an object of derision and embarrassment, has become the single most important asset of the village of Nieu-Bethesda. 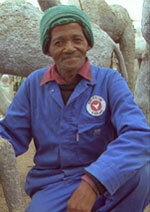 In order to accomplish the transformation of her environment, Helen Martins hired the services of local workmen. First Mr Jonas Adams, and then Mr Piet van der Merwe were employed with structural modifications to the interior of the house - mostly replacing original windows with the vast panes of glass that would bathe Miss Helens' home in multi-coloured hues of light. And when Miss Helen turned her attention to the outside of her house, she asked Piet van der Merwe to help transform her ideas into reality. An early cement owl constructed by Piet remains in the Camel Yard today. Around this time, Helen Martins employed itinerant sheepshearer and builder Koos Malgas. Koos also tried his hand at manufacturing cement and glass sculptures, and very quickly developed techniques for working with these difficult materials. Miss Helen obviously appreciated his ability to interpret her ideas and before long he was regularly employed on the creation of the Owl House. Every sculpture would be discussed beforehand, usually over early morning coffee in the kitchen, and although Miss Helen seldom did any of the physical work they would together engineer each new inspiration into being. This process developed into a uniquely symbiotic creative relationship that clearly defines Koos' integral part in the creation of the Owl House. Koos Malgas passed away in Graaff-Reinet on 20 November 2000. He was in his early sixties. In all, Koos spent twelve years working with Helen Martins on the Camel Yard, until her death in 1976. He stayed on in the district for a further two years, until he relocated to Worcester. In 1991 he was persuaded to return to Nieu-Bethesda where he was employed on restoration work to the Owl House until he retired in 1996.